Moist, open, grassy fields and meadows. This colorful, medium-sized moth, is the largest wasp moth in North America. The adult is 15 ⁄16″to 11 ⁄16″ long and has a wingspan of 19 ⁄16″ to 2″. The abdomen is metallic blue. The thorax is black and metallic blue. There are yellowish-orange scales on the sides of the first section of the thorax (prothorax) forming a collar. The collar does not extend across the upper (dorsal) surface of the prothorax. The forewings are dark grayish-brown with a metallic blue sheen at the base. The leading edge of the forewing (costa) is dark grayish-brown. The hindwings, not visible when perched, are smaller and black. Both wings have a short fringe that is at least partially white. The head is yellowish-orange. The antennae are feather-like with branches only on one side of most segments. The caterpillar is ⅝″ to 19 ⁄16″ long. The thorax and abdomen are nearly black. There is a broken, cream-colored subdorsal stripe and a broken, white, subspiracular stripe. On later instars the body is mostly hidden beneath dense tufts of long, stiff hairs (seta). Middle instar caterpillars lack these long white seta. There is a center (middorsal) row of black tufts flanked by rows of white, blond, or yellow tufts. The black tufts may be obscured by the longer flanking tufts. The head is orange to red except for a black triangular area between the eyes (frons). The abdominal leg-like structures (prolegs) are reddish. Mature caterpillars are found in May to early June and again in the fall. Yellow-collared scape moth (Cisseps fulvicollis) is smaller and has much narrower wings. The discal area of the hindwing is translucent. The basal half of the costa is yellow. The thorax is black. The yellowish-orange collar extends evenly across the nape of the neck. Mostly grasses, but also sedges and irises. Caterpillars overwinter beneath leaf litter or matted grass. Adults fly primarily during the day, but are also attracted to light at night. Sources: 7, 21, 24, 29, 71, 75. 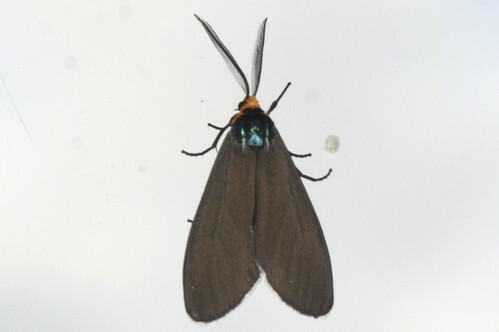 This and other Ctenuchid moths have three adaptations that help to protect them from predators; aposematism, sound production, and pyrrolizidine alkaloid sequestration. Aposematism: The metallic blue color of the thorax and abdomen mimics wasps which may be noxious to predators. Sound production: A specialized (tymbal), corrugated region on the third section of the thorax (metathorax) produces ultrasonic sounds which interfere with (“jam”) the sonar of moth-eating bats. Pyrrolizidine alkaloid sequestration: Caterpillars acquire and retain naturally produced toxic chemicals (pyrrolizidine alkaloids) from the plants they eat. In grasses: The area on the back of a grass leaf at the junction of the sheath and the blade. In moths: the array of scales on the dorsal part of the prothorax. In plants: The central axis of a pinna, to which pinnules are attached. In Lepidoptera: The leading edge of the forewing. Sometimes the mosquitoes in North Dakota are so numerous that they must occasionally find places to perch on other insects. ;-) Photographed at Turtle River State Park, North Dakota (14 June 2010). 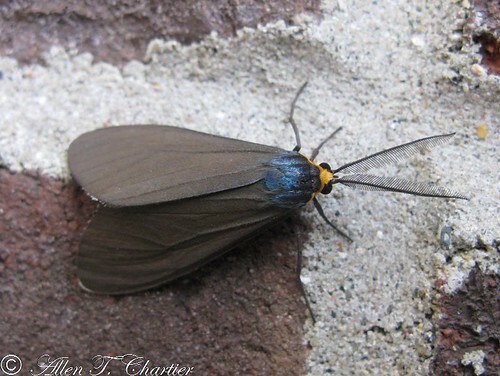 In late June and July day flying moth Ctenucha virginca, commonly called Ctenucha moth of Arctidae are seen commonly nectaring on flowers of Asclepias. Apocynum, sweet clover etc. The blue on the head and shoulder, to me looks like hind of a frog, may be a poisonous dendrobid frog. This beautiful Virginia Ctenucha Moth was in my garden feeding on some Echinacea purpurea 'Prairie Splendor'. Location: Taken in an area of mixed woods near a tributary to the Wild Rice River in Norman County, Mn.